Pasadena, Long Beach, Culver City, Koreatown, Hollywood, Santa Monica, Azusa. These are all the L.A. neighborhoods and satellite cities that are part of the Metro rail system, or will be by the summer; eventually even Century City and Beverly Hills will join that list. One area without plans for their own subway or light rail is West Hollywood—a city that desperately wants it. 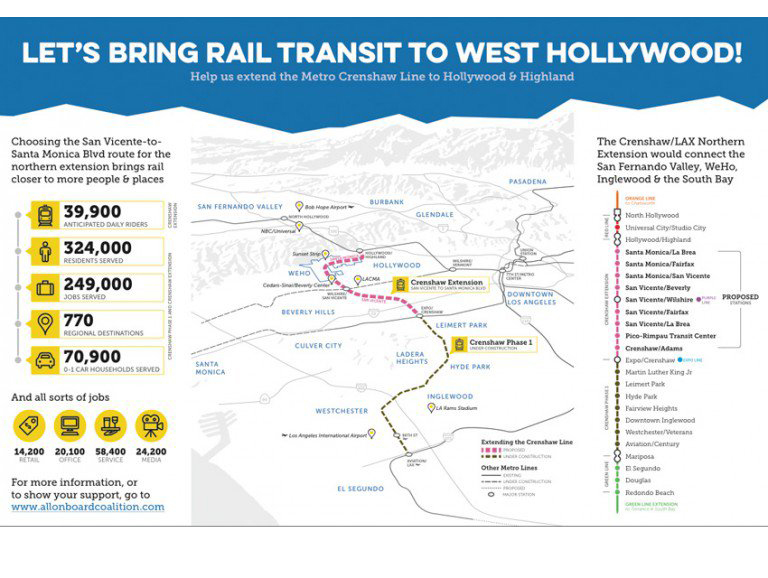 WeHo officials are now actively lobbying for rail transit, forming a coalition called West Hollywood Advocates for Metro Rail (WHAM) that are hoping to convince the folks at Metro HQ in DTLA that they need to get serious about a WeHo line. Specifically, WHAM is calling for a northern extension of the under-construction Crenshaw Line, which will connect the South Bay and the LAX area with the Crenshaw District in 2019 or 2020. The line would likely be completely underground and would terminate at the Hollywood and Highland Red Line station. We posed a few questions to Lisa Belsanti, WeHo’s communications manager and a major force behind WHAM, about the proposal. How did WHAM come together? Belsanti: WHAM is an all-volunteer coalition of folks supporting Metro bringing rail to WeHo. Back in July 2015, the City Council called for a grassroots approach and in January outreach teams attended several events to launch the CitylineX free shuttle to connect to the redline. The WHAM team has already collected about 3,000 signatures from WeHo and at points all along the entire Crenshaw corridor. Does Metro know about WHAM? Yes. In fact, Metro staff and incoming Metro Board Chair John Fasana has been at some of our outreach events. What’s the update with Crenshaw Line’s northern extension? The next step is a feasibility study by Metro starting this month, looking at the opportunities and constraints of different alignments, including costs. The study is anticipated to take 14 months. Based on Metro CEO Phil Washington’s “shovel ready” initiative, the next step would be to proceed with preliminary engineering and a full EIR to get the project (and many others) shovel ready so they can be implemented as funding becomes available. Also, we MUST ensure that the full Crenshaw Line’s northern extension project is included in the Metro Board adopted Expenditure Plan which would be voted by the public in November 2016. Where would WHAM’s ideal station locations be? 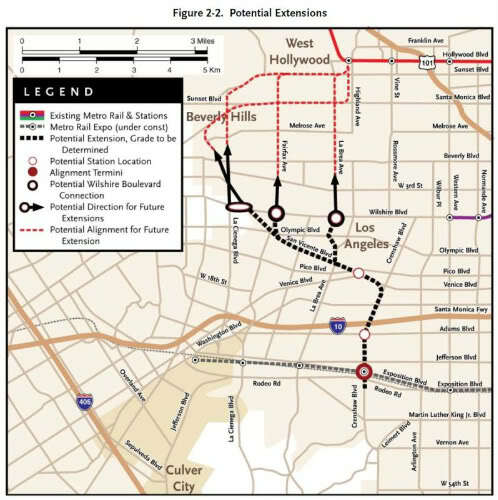 Station locations are part of Metro’s feasibility study, but preliminarily, WHAM is advocating for a San Vicente to Santa Monica alignment, with stations located per the attached map. Some have advocated for the Crenshaw Line to go straight up La Brea Avenue, which would skirt the east side of WeHo. Would WHAM be opposed to that? The preliminary analysis shows that the San Vicente to Santa Monica alignment would best serve the City of WeHo and the region, so unless new analysis points to a better alignment, WHAM will continue to support the alignment that optimizes regional connectivity, mobility and access. Will WHAM help campaign for an extension of Measure R to help fund the transit line?